He is a cutie! Pulling is a common, dare I say, universal problem with huskies. The first thing you can try is to walk and when he starts to pull, just stop and wait. When he (finally) gets bored and comes back and has loose leash, start walking with him. Repeat as necessary. With our boy, the first time we tried this (he was a year old rescue with NO leash training) I think we went about 600' in the first 20 minutes If you are persistent and consistent, it is possible that this will all you have to do. We ended up using a prong collar. Others use a variety of front clip harnesses. Or e collar training (teaching "heel"). You can search this site for all those terms, including pulling - pulling and mouthing are common problems with the breed and lots of people have chimed in - I particularly like the prong but would not use it yet on a 3 month pup. 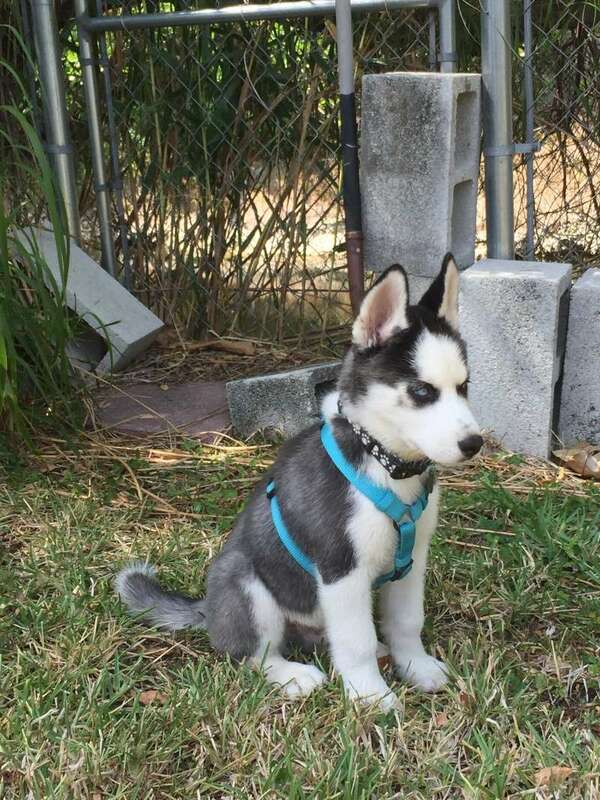 He's small enough, you still have a chance of trining leash manners by command only. As for jumping on people - train the sit command and when people approach, make him sit. I would keep him tethered to you for now when out and about (in and out of house) If not tethered than crated or confined to a small area with baby gates. That way, when someone comes in, you have the tether ready to restrain him, make him sit and not jump. Thank you, that is very helpful advice! I definitely see that with owning a husky you must have A LOT of patience. Ami is such a cutie as well! Did you have any problems with his teething?Ghosts teething has gotten bad and I know with puppies that's normal but with Ghost it is aggressive teething. He chews on EVERYTHING. He even cracked one of his canines... do you have any tips on how to calm his teething? People on here have recommended frozen carrots - I've never tried it, not had a puppy since 1973. I would think frozen anything about could be used. The cold helps to numb the achiness of the new teeth. Carrots, yogurt, green beans. I give mine fruit frozen in ice cubes in summer and they crunch on those.